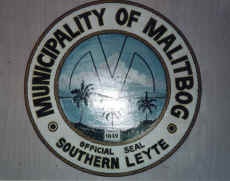 The Municipality of Malitbog is located in Region 8 specifically in the Southern part of Leyte. 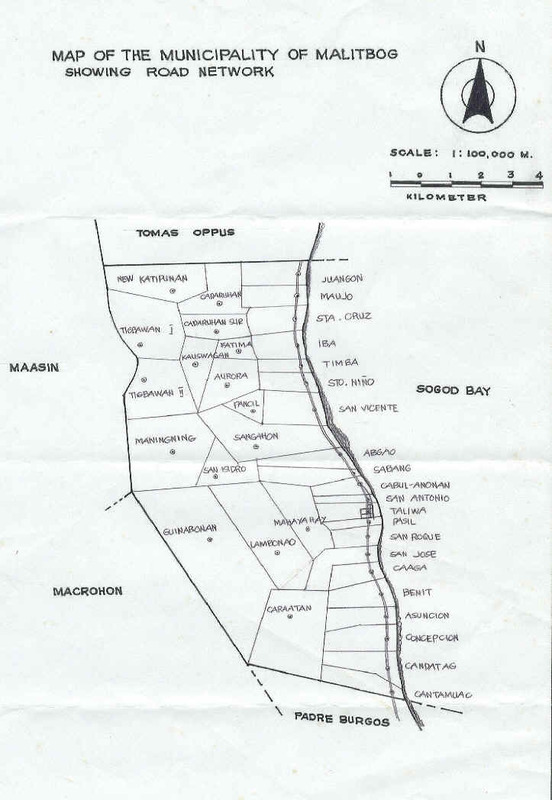 It is situated along the coast of Sogod Bay where it is bounded on the Southwest by the Municipalities of Macrohon and Maasin and on the south by the Municipality of Padre Burgos and Limasawa Island which is now a municipality. It has 37 barangays, 4 of which are in the interior, 12 in the mountains, and 21 coastal barangays. 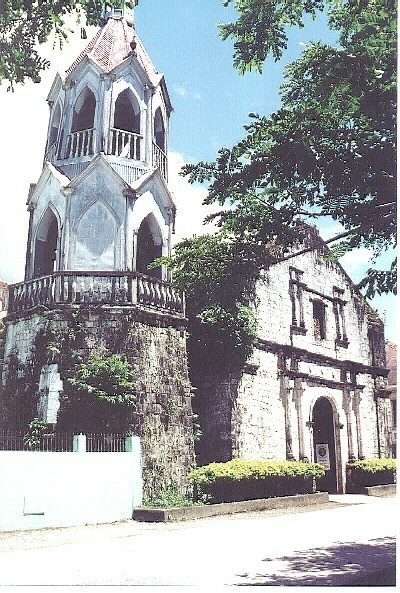 One of the oldest towns in the region, it used to be the center of trade and commerce in the Eastern Visayas where the finest abaca were produced and exported to the world. 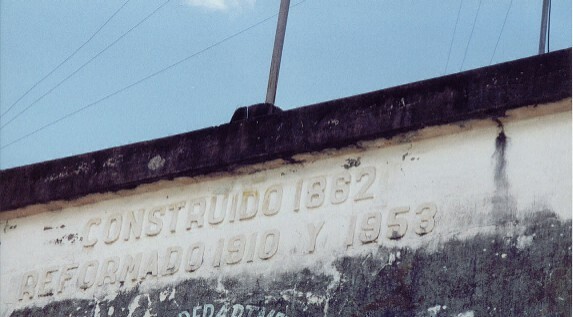 Until now, the culture of the people still reflects some Spanish influences. It still values the age old tradition of respecting the elders by kissing their hands and their devotion to the Catholic faith is overwhelming (90% of the people are Catholics). Aside from their religiosity, the people are warm, hospitable, hardworking, and know how to live life inspite of/despite of adversities. 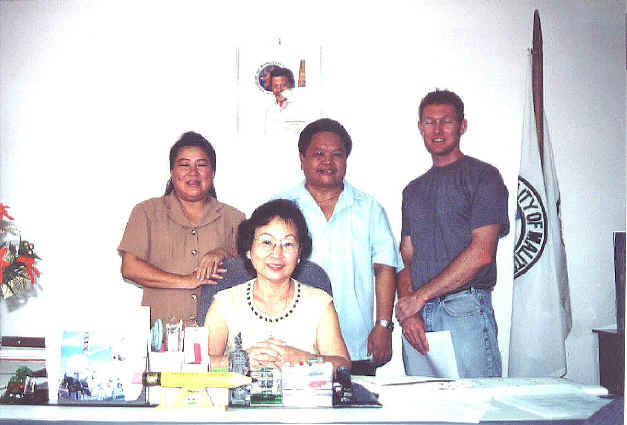 Vice-mayor - Hon. Jose M. Go, Jr. 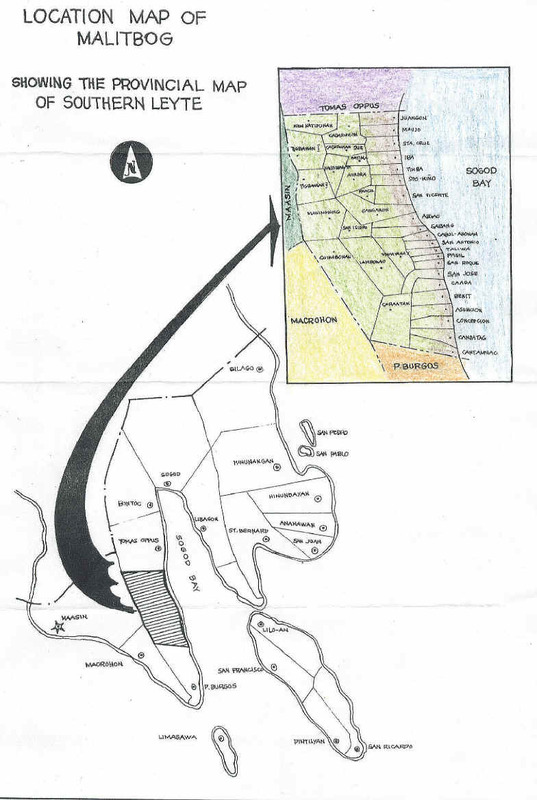 The Municipality of Malitbog is predominantly agricultural with a total agricultural land area of 6,603.52 hectares or 77% of its total land area which is 14,042 square kilometers. The major crops are coconut, rice, coffee, peanuts, and bananas. At present, 55 hectares are planted with mangoes. In support of the municipality's agricultural economic activities are two rice mills located outside the Poblacion. 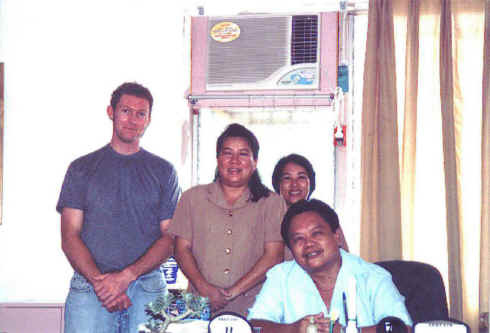 There is also the Malitbog Rural Bank, Inc. which extends credit services to farmers. It has also two breeding stations - the swine breeding station located at Barangay Cabul-anonan and the Goat Dairy Farm & Breeding Center at Barangay Sangahon which also serves as a regional training center for farmers. Another source of livelihood is fishing and measures are undertaken to protect and conserve the marine resources through the Coastal Resource Management Program. 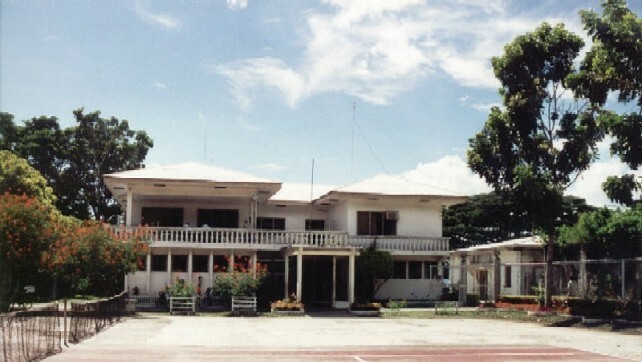 The Municipality of Malitbog has been considered as the Center of Arts and Culture in the Province of Southern Leyte. 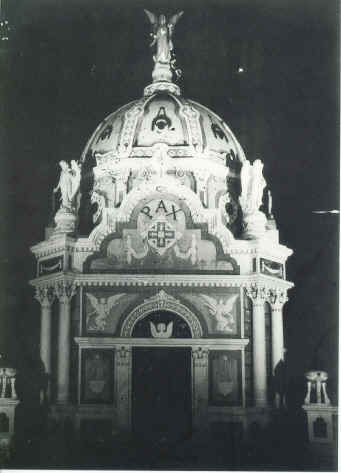 It has interesting tourist spots and cultural attractions that may trace the history of the past generations. 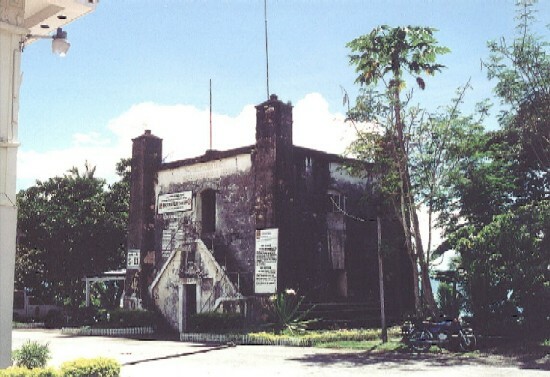 The 17th century "baluartes" or Watch Towers in Barangays Caaga and Sabang as well as the present Philippine National Police Station served as fortifications of the natives from the Moro pirates. 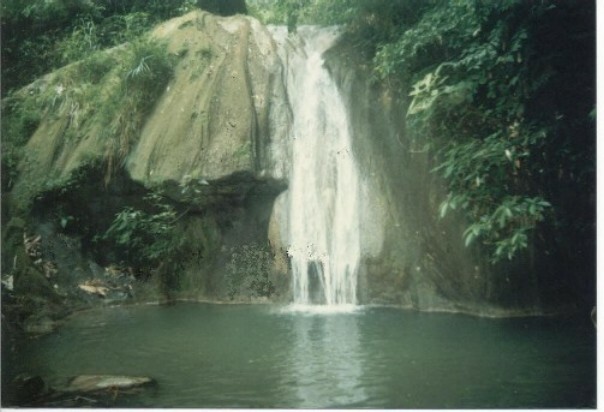 The Municipality also has beautiful waterfalls in Barangays Candatag (picture shown), Benit, and Timba, and caves that have remained unexplored in Barangays Caaga, New Katipuanan, Tigbawan, and Kauswagan. There are beautiful caves where bio-diversity exists. Gifted with beautiful beaches, it has many beach resorts like the Happy Dove Beach Resort and Lodging House and the Washy & Wishy Beach Resort, both in Barangay Abgao, the Lorenzo Baybay Beach in Barangay San Vicente, the Dai-dai Beach Resort in Barangay San Roque, and a new beach resort in Barangay Juangon owned by the Tidalgo-Urgello Family. Corrals of different shapes and sizes abound in the municipal waters which can be possible dive areas for tourists. 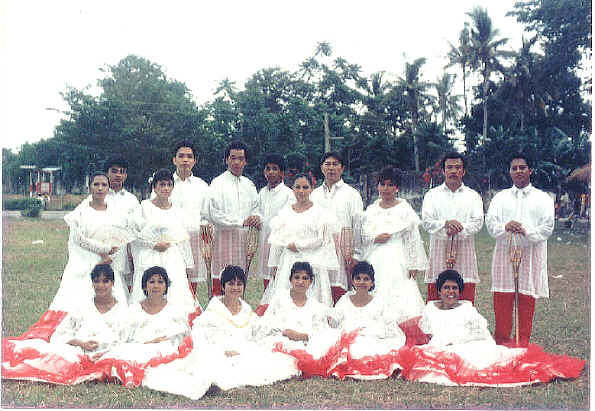 During the summer months of April and May, fiestas abound in the municipality and some barangays stage the "moro-moro", more popularly known locally as "ensayo" depicting the conflict betweeen the Christians and Muslims with the script written by one of the local folk. It is a big production that involves so much logistics and entails so much work which the people readily contribute and get involve in. 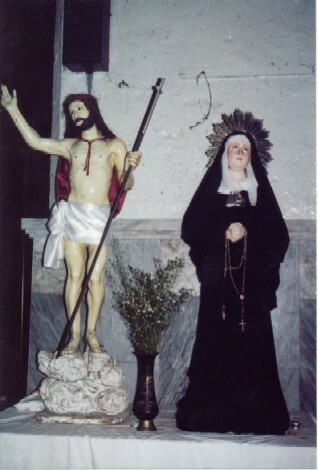 In the Lenten season, there is the Senakulo, reliving the sacrifices of the Lord Jesus all the way to Calvary and the "Sugat" on Easter Sunday depicting His resurrection. The famous festival in the municipality is the Malitbog Sinulog Festival which is held every 15th of January in honor of its Patron, the Senor Santo Nino or the Holy Child Jesus. In the last 15 years of its existence, thousand of devotees flocked to the town to witness the Sinulog Mardi Gras. It is one event every Malitboganon looks forward to, especially those who no longer reside here. 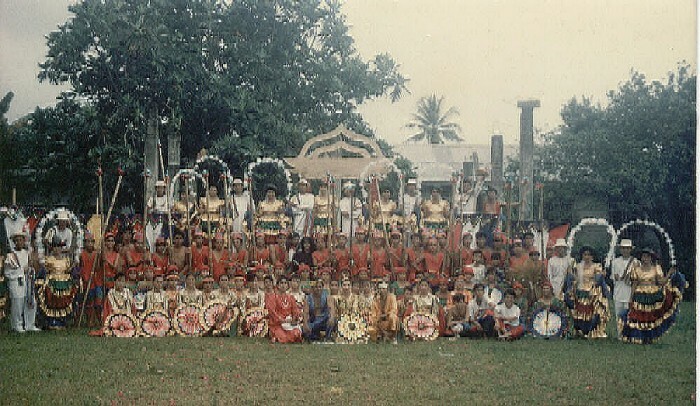 The Sinulog Core Group which is composed of dancers from all walks of life - students, out-of-school youth, young mothers, young professionals - has been invited to perform in other parts of the country. One of the proudest achievements of the municipality in recent years was winning the Centennial Decor Contest for 5th and 6th class municipalities in the National Level during the celebration of the Centennial of Philippine Independence. A monument will be constructed at the Town Plaza where the plaque awarded by then President Fidel V. Ramos will be permanently enshrined to serve as a lasting legacy to future generations. It served as an example of a people united as the whole municipality came alive with decors commemorating the centennial celebration. One trait which the Malitboganon has and which he carries in his heart wherever he is and wherever he goes, is his love of God, love of country, love of family, and pride in his roots. The greatest gift of the municipality is its people, always radiating their love for their hometown no matter what, no matter when, no matter where. BASTA MALITBOGANON, IKAPASIGARBO KA ! ! !